The now disused St Margaret’s Head Tunnel was a structure originally formed as part of the Dunfermline to North Queensferry railway line, providing a link to the ferry service until the opening of the Forth Bridge in 1890 and remaining in limited use for freight until 1954. The vaulted roof and brick lined tunnel is located 15 metres below the A900 trunk road and the B981, adjacent to the northern approach to the Forth Road Bridge. Cordek were asked to supply a structural fill solution, encapsulated within a protective membrane to fill the entire cavity of the tunnel. After thorough inspections of the tunnel were conducted, multiple signs of deterioration were detected. 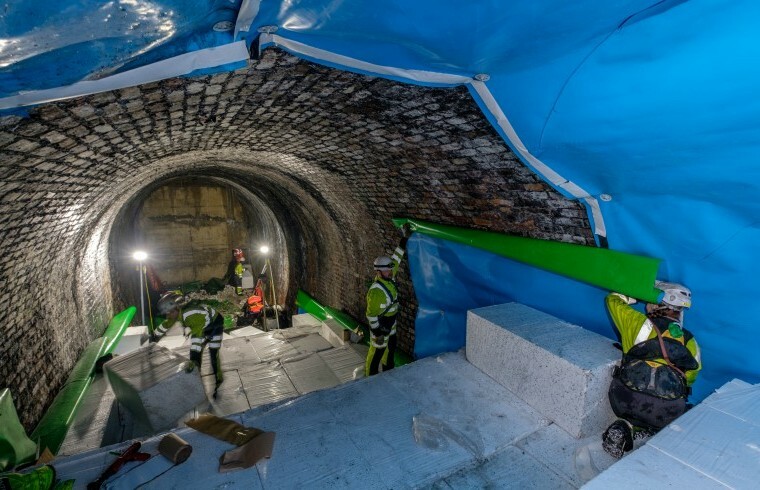 Two options were considered to make the tunnel safe; to continue to monitor and carry out localised repairs or to infill the entire tunnel void with a lightweight structural fill solution. Following an initial consultation, a formal technical proposal was delivered with full costings to Transport Scotland for approval. 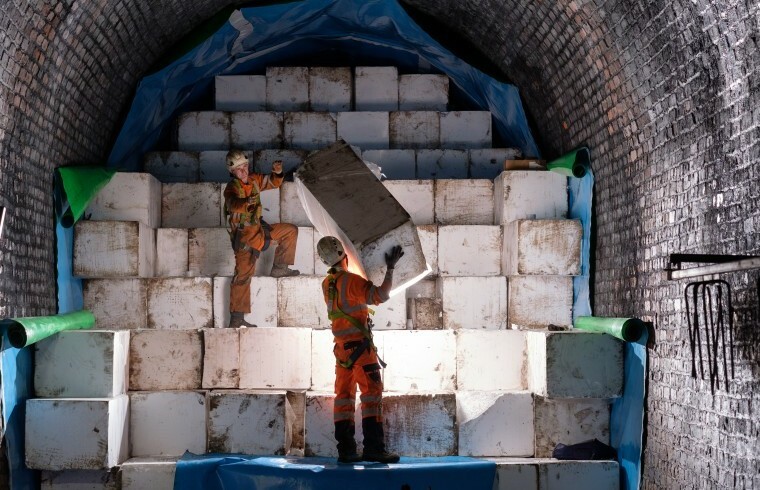 The decision was made to infill the tunnel with the cost-effective, lightweight infill material Filcor 20 Expanded Polystyrene (EPS) with a Flame Retardant (FR) additive. An additional benefit of this solution is that it would be reversible should the tunnel ever need to be re-commissioned at a later date. 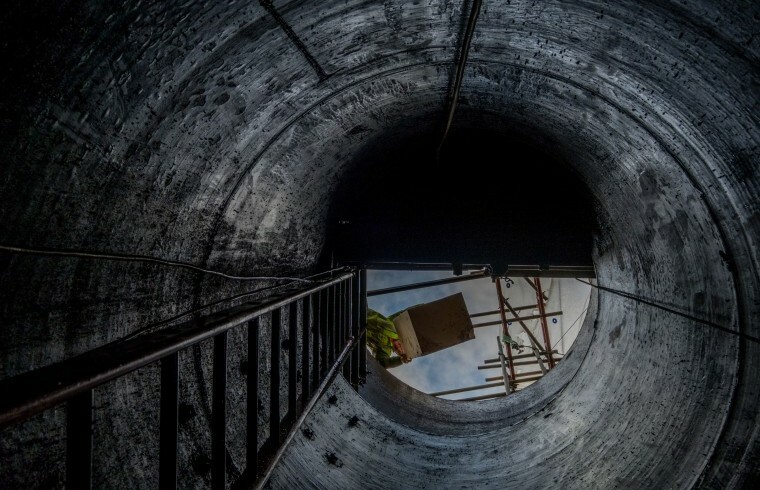 The 420.0 m long, 4.3 m wide and 5.1 m high tunnel had previously been sealed off at both ends and the adjacent cuttings filled in, with the only remaining access points via vertical shafts at each end. Due to the restricted opening of the access shafts, the Filcor 20 EPS was manufactured in 1200mm x 600mm x 500mm blocks to reduce wastage and allow for manual handling within the confined space. 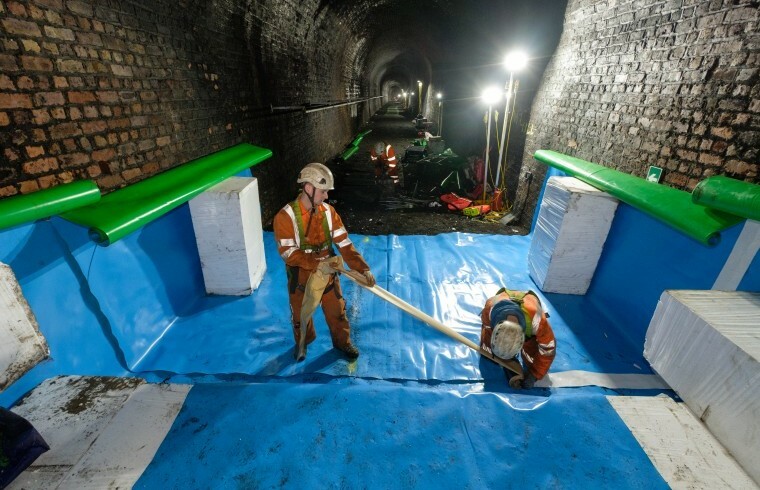 As the tunnel was previously used for rail and its location was under a trunk road, the precaution was taken to protect the Filcor 20 EPS blocks from any potential oil deposit build-ups and fuel spillages by using the Cordek VOC Membrane to line the tunnel prior to installation. To ensure that the Filcor 20 EPS blocks were able to fit down the access shafts, a sample block was provided at the required dimensions to test the practicality of this method. 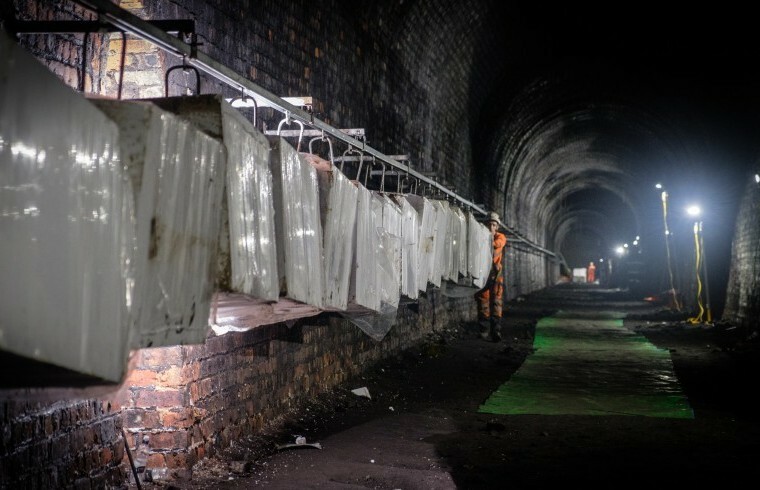 Following successful trials proving that suitable access to the tunnel could be achieved, the tunnel was lined with the Cordek VOC Membrane that would encapsulate the Filcor 20 EPS blocks. Due to the vast void there was to be filled, the site received two articulated vehicle deliveries of Filcor 20 EPS blocks a day, three times a week to meet the installation programme for the project. Once offloaded at the surface, the Filcor 20 EPS blocks were lowered down the access shafts and onto a specially designed monorail system to travel the length of the tunnel. The blocks were built up gradually in stepped layers to allow for safe working at height. Once complete the access shafts were filled with concrete to seal the tunnel and prevent any potential damage to the Filcor 20 EPS blocks in the future. Deliveries were made from December 2017 until March 2018 and in total 116no. articulated vehicles delivered 21,342 no. Filcor 20 EPS blocks to site. The use of large, articulated vehicles helped to reduce the impact on the surrounding neighbourhood, as it meant that the number of deliveries was reduced to a minimum. Ultimately, the project was delivered in full, on time and within budget with minimal disruption to the local roads networks, residents and businesses.